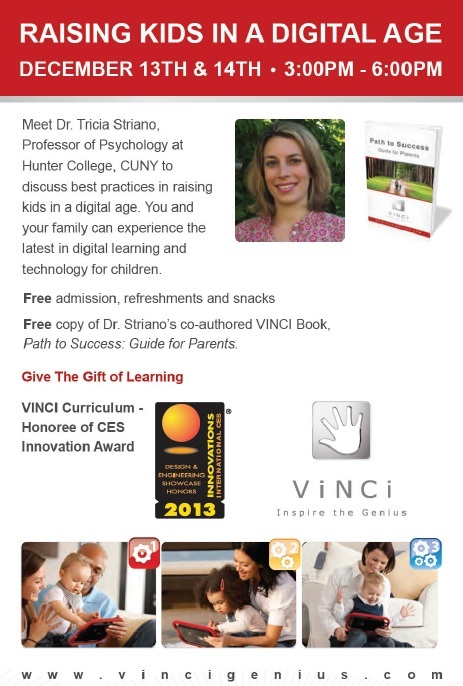 Come meet Dr. Tricia Striano, Professor of Psychology at Hunter College, CUNY. She will discuss best practices of raising your child in a digital age. You and your family can experience the latest in digital learning and technology for children. 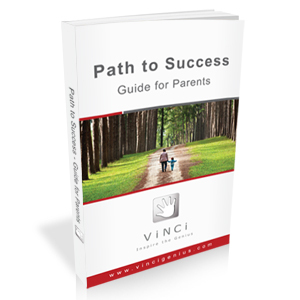 Receive a FREE copy of Dr. Striano’s co-authored Vinci Book, “Path to Success: Guide for Parents”. From Constructive Play theory and latest scientific research to using technology as a learning tool, Path to Success: Guide for Parents intends to help parents visualize their children’s intellectual needs and lays out a personalized learning plan for their achievement of future success. Preface by Dr. Dan D. Yang, Creator of VINCI, PhD, serial entrepreneur and a mom. Chapter I Constructive Play by Dr. George E. Forman, Professor Emeritus UMass at Amherst, former president of The Jean Piaget Society, researcher in developmental psychology for the past 36 years. Chapter II From Research To Practice by Dr. Tricia Striano, Professor of Child Psychology, Hunter College, The City University of New York, Head at HowBabiesLearn.com, a developmental psychologist for nearly 20 years. Chapter III Lesson Plan And Guide by Sarah Cowan, Master in Education, certified Montessori teacher and preschool administrator for over 11 years.